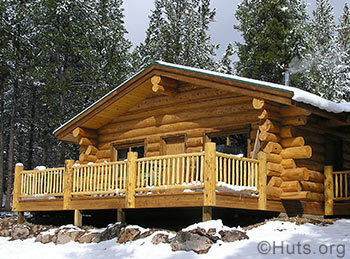 Continental Divide Cabin is a privately owned hut booked by 10th Mountain. This hut, aptly named, is relatively easy to get to and also serves as a connection between the 10th Mountain Division Hut, Sangree's Hut, and Vance's Cabin. Plus, there are over fifteen miles of rewarding beginner to intermediate cross country ski trails close by, and other opportunities for rewarding day trips. Nearby Chicago Ridge and Ski Cooper offer the closest "turns". Layout and capacity: Single story cabin sleeps eight (8). Two private bedrooms each sleeping two people and an additional four beds in the common area. All beds are singles. Additional Amenities:A small solar refrigerator, solar lights, a wood burning heat stove with oven, propane burners, pots/pans/utensils, and an outdoor propane grill (no fire-pit) are provided. There is a cistern with a pump, water needs to be filtered (in winter snow can also be melted for water). Other: mattresses/pillows for 8, attached outhouse. For children: 2 portable cribs, a high chair, a potty seat and a nearby tipi (you can find photos of it by clicking on the photo above). Additional summer amenities include: comfortable porch furniture, a nearby children's fort and a wheelbarrow for gear (left near the green gate in the parking lot, for use on the closed access road). Access:The cabin is a .8 mile ski/snowshoe/hike from the Tennessee Pass Trailhead along the Colorado Trail (Warning: trail exits parking lot it two directions, be sure to travel in a southwesterly direction). See also our Tennessee Pass Trailhead Directions. The main winter route into the Continental Divide Cabin follows the Colorado Trail southwest from Tennessee Pass for approximately .5 miles. It then turns off on a well marked side trail that takes you the last .3 miles to the hut. 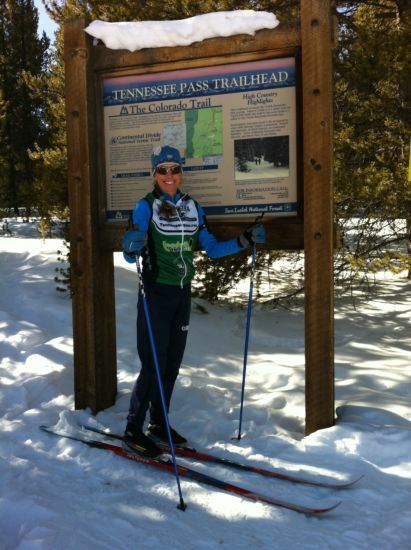 To hike or bike into the Continental Divide Cabin in the summer you can simply follow the winter ski trail. There is no vehicle access to this hut in the summer. The Continental Divide Cabin has numerous summertime activities most of which are right outside the front door or just a short drive away. There is hiking and mountain biking along the Colorado Trail right outside the hut as well as trails at Ski Cooper and the Camp Hale area. You can go fishing at the Camp Hale Pond up the road at Camp Hale or you can head down the road to Turquoise Lake. If you don't feel like cooking at the hut you walk or bike back out to the trailhead, cross Highway 24 and have lunch or dinner at the Tennessee Pass Cookhouse.